Squat on the loo its good for you! Empty both bowel and bladder using the natural squatting position. 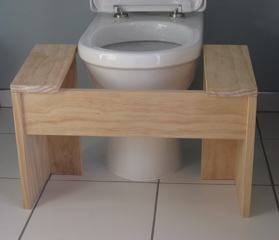 The Lillipad Squatting Platform makes your toilet more usable for you, your family and guests. 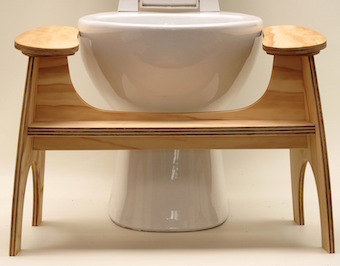 The Lillipad is designed to sit level with or lower than the rim of the toilet. It is available in short, tall and height adjustable models. 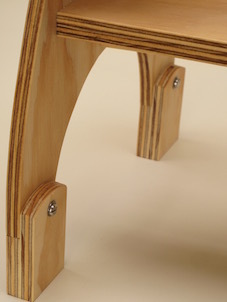 To ensure comfort, the footpads slope forward and tilt slightly towards each other. 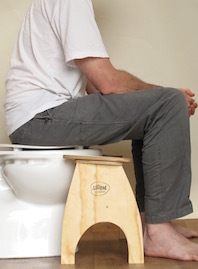 The Lillipad supports a true squat posture for the best bowel movements and an empty bladder. The rim of the toilet can be used in conjunction with the Lillipad to raise the heels slightly, supporting an easy, narrower, squat. 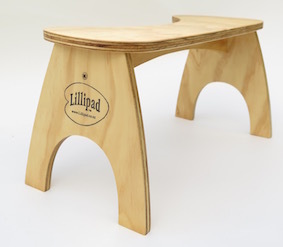 The step on the Lillipad provides access for children, and assists a beneficial squat-like position. Perfect for those new to squatting looking to graduate to a proper, full squat. 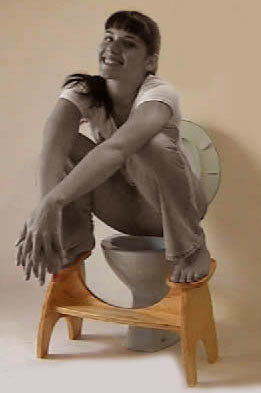 When in position the toilet can still be used in the sitting posture. 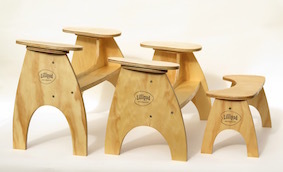 The Lillipad encourages healthy and hygienic squatting. 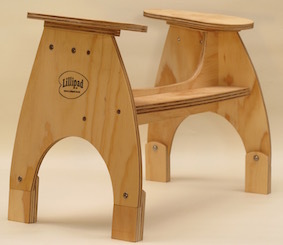 The separate Lillipad footstool provides access for children, and assists a beneficial squat-like position for less flexible people. Squatting straightens our internal pipes releasing waste to flow. Deep squatting is balanced and requires no props. Infants instinctively squat, it is the natural way we evolved to go! … more on the ‘Health Benefits’ page via the Menu. Watch this 30 second video to see how to squat on your toilet using a Lillipad. The height adjustable Lillipad (above) has additional feet allowing it to change between the tall model and the short model height settings. The plywood feet store conveniently out of sight under the footpads when not in use. 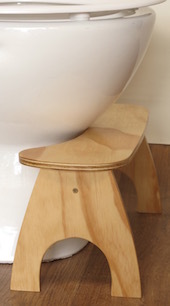 The footpads on all models can be adjusted side to side to ensure a good fit around your toilet. The tall Lillipad is 381 mm (15 in.) high, the short Lillipad is 323 mm (12 ¾ in.) 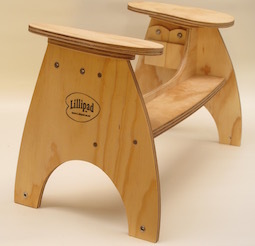 high, and the Lillipad footstool is 203 mm (8 in.) high. To find prices, place an order, or contact us - please read the ‘Buy Now / Contact’ page via the Menu. We also offer plans to build–your–own squatting platform for just US$5 (customise your squatting position). Available on the ‘D.I.Y. Plans’ page via the Menu. The Lillipad footstool is stable, strong and easy to clean. It also provides a step up to the hand basin for kids. All the Lillipads are proudly made in New Zealand using plywood made from local, sustainably grown pine and finished with a durable, certified ‘toy safe’ oil/varnish ⎯ for decades of daily use. … more on the ‘About the Lillipad’ page via the Menu. The first Lillipad was made in 1991 after using the squat toilets while traveling through Asia. Producing something helpful motivates us, as does wonderful customer feedback, and a certainty that squatting is the way to go! My Lillipad arrived last week in excellent shape. Thanks for the fast shipment. And, I have assembled it. That went very well. Everything fits together very nicely. And, I have used it. So far so good ... Better than good ...Terrific actually. As you know, I have a Squatty Potty. Well, I prefer the Lillipad to the Squatty Potty by a significant margin. The Lillipad is actually easier to get situated on initially. But, its real advantage is that it allows for a much more complete squatting posture. That's what I was hoping would be true, and it is. So, functionally, the nod goes to the Lillipad. It's not even close. Obviously, the SP is a lot cheaper. But, that doesn't really count for much since the thing doesn't function as effectively. The SP doesn't require any assembly either, but that also is not a big deal in my book. So, I'm very pleased that you guys invented this device. I also appreciate the Lillipad's careful design and nice workmanship. Also, it is very stable, that’s no small thing either. Again, thanks very much for the nice product. Much appreciated. … more from our customers on the ‘Reviews’ page via the Menu. Squat toilets are also known as Arabic, Chinese, French, hole in the ground, Indian, Iranian, Japanese, Korean, natural-position, Nile pan, squatty potty, Kimchi squat, Turkish, and hunkerin’ toilets! For all of you who thought Lillipad was spelled Lily Pad, Lilypad, Lilly Pad, Lilipad or Lillypad, good on you for finding us! © 1991 - 2019 Robert Wait, Lillipad Ltd.